Games, food, snacks, a giant cake, an indoor pool. All this and more at Apple Bumpkin's birthday party on 11/20 at the Crescendo Kite residence! Everypony welcome, the more the merrier! No gift required! There's an awful lot of hustle and bustle coming from the west end of the Twilight Library surrounding. It seems a construction crew from out-of-town has arrived and are briskly working to construct a new building. What it is exactly is unclear. It's surrounded by scaffolding and tarps, spotted with the occasional logo of the CCC (Canterlot Construction Company). Who the building is for is unclear but the workers are moving at a shockingly fast pace. Why, it seemed only yesterday that this place was a clear, grass field spotted with trees and now it's constantly drowned in dust and the loud sounds of hammers pounding, saws cutting and gruff ponys shouting one command or another day and night. Within a few days work, the building had already grown a second story and a by the next day work was already beginning on the exterior. Whatever it is, it won't be long before it's completed. Stop by the Sun and Moon today with this flyer to receive a free session! The Sun and Moon is a therapy and counseling center with a commitment to solving everything from simple life problems to mental disorders and addictions of its clients. We are located near Twilight's Library and the schoolhouse and have flexible hours for appointments to be made at virtually any time convenient for the client. We have prices available for even the tightest budgets, and nobody is ever turned away because they can't pay. Note: This is an original location, not canon. Sapphire is hurrying around putting these posters everywhere, and some in the most absurd places! 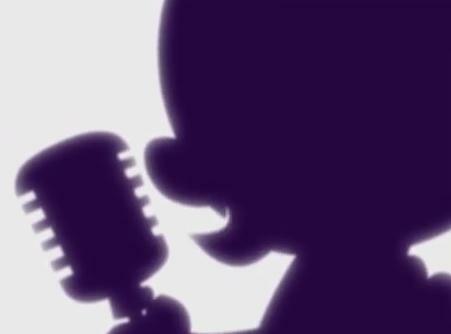 Really, who is going to see a poster underneath somepony's front porch or on a rooftop anyway? She seems rather distressed, and hurries along her way out of town and towards the forest to check her traps. 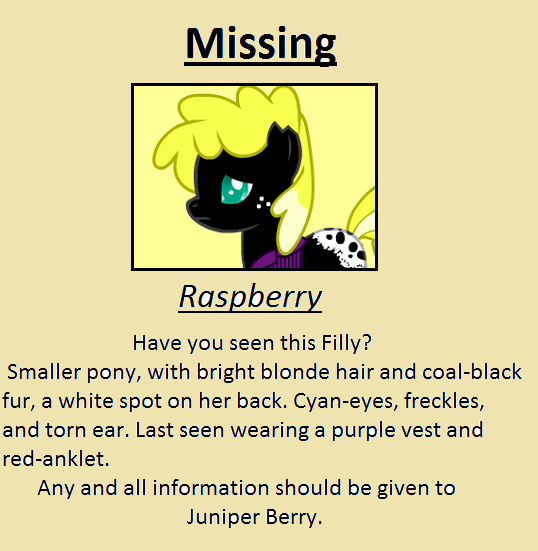 If they haven't caught her by now, hopefully somepony will find her. Type of place: Night Club and refreshment bar. Signs have been posted about Ponyville, containing no more then simple writing and a picture. The picture is of a young Filly, the pony seeming somewhat... scared. Smaller pony, with bright blonde hair and coal-black fur, a white spot on her back. Cyan-eyes, freckles, and torn ear. Last seen wearing a purple vest and red-anklet.